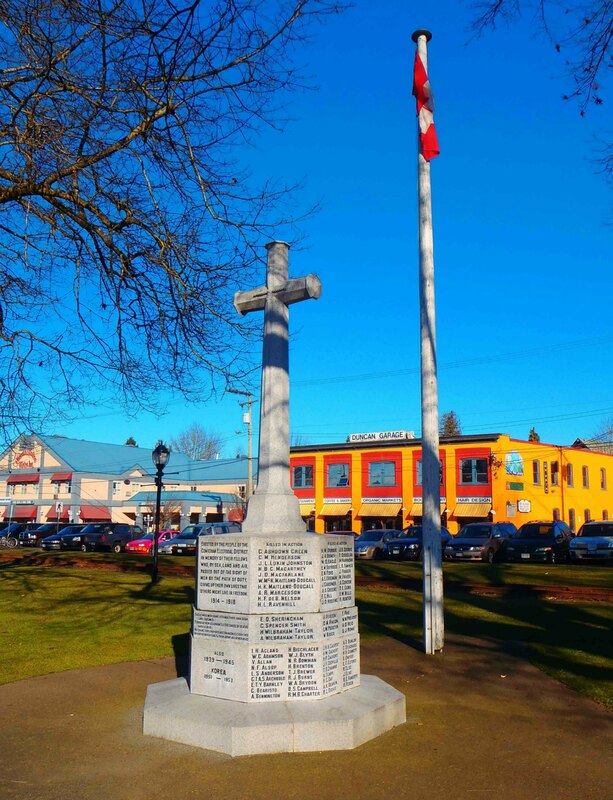 The Cenotaph is in Charles Hoey Park, on Canada Avenue in downtown Duncan. Charles Hoey Park is named for Major Charles Ferguson Hoey, M.C., V.C. (29 March 1914 – 17 February 1944), who was born and raised in Duncan and was awarded a posthumous Victoria Cross for his actions in leading an attack on a Japanese position in Burma (now Myanmar) on 16 February 1944. Lest We Forget, here are the names listed on the Duncan Cenotaph. In order that these veterans may be better remembered, we will gradually add links to separate pages with information on each individual name on the Cenotaph. Alick Thomas Bentall CHARLESWORTH (2nd Lieutenant. Died 30 May 1917, aged 24, while serving with the Royal Flying Corps. Buried in St. Mary and St, Peter’s Churchyard, Harlaxton, Lincolnshire, U.K.
Oliver COLLIARD (Private. Died 19 August 1917, aged 21, while serving with the 29th Battalion, C.E.F.. He is buried in Fosse No. 10, Communal Cemetery Extension, Sans-En-Goheele, Pas de Calais, France. Harold BISCHLAGER (1921-1941) died on 18 December 1941 while serving with 97 Squadron (Bomber Command) in Lincolnshire, U.K. Buried in Coningsby Cemetery, Lincolnshire, U.K.
James Francis CODVILLE – Pilot Officer, died 5 November 1941, aged 20, while serving with 407 Squadron R.C.A.F. in the U.K. Buried in Oldebroek General Cemetery, Netherlands. Grant DEUCHARS – buried in St. Mary’s Anglican Cemetery, North Cowichan, B.C. A member of Temple Lodge No. 33, Duncan. Comments or Questions about anything on this page?